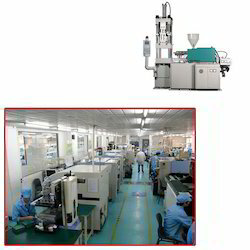 Our product range includes a wide range of insert moulding machine for electronic industry. Our organization has successfully expanded its business in the market owing to the offered elevated quality array of Insert Moulding Machine for Electronic Industry. Employing latest technology, the offered product is manufactured using top grade material at our sophisticated manufacturing unit. Offered range is ideal for producing automobiles and engineering components, computer components, electrical & electronics components. These are available in various specifications to meet the variegated needs of the clients.